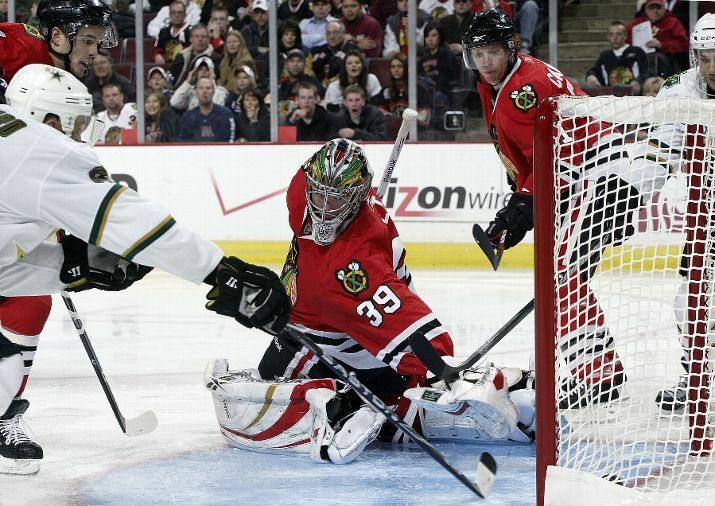 Should the Blackhawks Buyout Cristobal Huet? The players with an asterisk next to their cap numbers indicate that they are in the final year of their curent contract in the 2010-11 season. 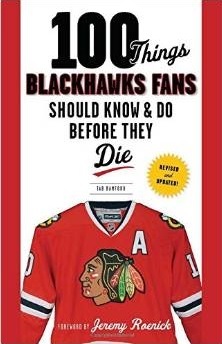 So the reality for the Blackhawks is that not only do they need to cut payroll off their 2010-11 books, but they have decisions to make with some current players, especially Seabrook, Byfuglien and Niklas Hjalmarsson (a restricted free agent after this season), during next year. Earlier this year, we discussed how the NHL’s current collective bargaining agreement works with regard to buying out the contract of a veteran player. At that point, early in the season, buying out Campbell’s enormous contract was a point of interest. However, considering Campbell’s play since then, keeping him on the blue line despite his cap number seems to be a better idea than moving him for nothing. Indeed, even trading Campbell wouldn’t seem to be a great idea at this point because of how well Campbell’s been playing. Considering the cost of replacing someone who is playing as well as Campbell is right now doesn’t even figure to be a likelyhood in respect to the escalating cost of elite defensemen in the NHL. Chris Pronger will be at $7.5M when his extension kicks in with Philadelphia next year, Zdeno Chara is making $7.5M, and Calgary’s duo of Jay Bouwmeester ($6.8M) and Dion Phaneuf ($6.6M) set the market for a top defenseman well above the cap number the Hawks will have for Keith moving forward. Reality seems to indicate that Campbell could be at or below market value within two or three years. Because of the wild trade speculation in the NHL right now, and teams looking to get a lower cap number, including the Hawks, good players on the Chicago payroll have been linked in many rumors. Barker, Versteeg, Byfuglien, Sharp and Sopel have all been linked to various rumors, most recently with regard to a potential move that would rent Atlanta superstar forward Ilya Kovalchuk for the rest of this season. On Wednesday, ESPN’s Pierre LeBrun wrotean article that looks at how the current CBA has impacted parity in the NHL, and how it has diminished the window to win for any team that puts together a great roster. Right now, the biggest team dealing with that reality is the Blackhawks, and when the cap is examined further it appears the Hawks have a limited horizon to win the Stanley Cup despite the extensions they have in place with some of their younger superstars. This school of thought is a driving force behind the speculation that the Hawks are the frontrunners for Kovalchuk, who reportedly will want to test free agency this summer and will want a deal in the neighborhood of $10M per season and around 10 years in length. Not many teams will want to part with a package close to what the Thrashers will want for one of the game’s top scoring forwards, only to have zero guarantees that they will be able to keep him after this season; the Blackhawks might not have a problem renting a player while moving payroll of their future books. 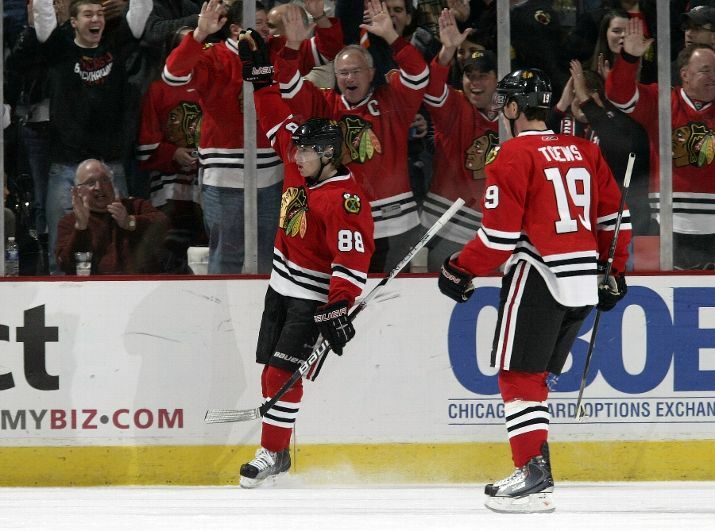 So how do the Blackhawks unload $10 million without devastating the current roster? One route that might become a reality is buying out Huet. He’s statistically playing very well this year – he currently ranks fifth in the NHL allowing only 2.17 goals per game – but, because of his ups and downs might be easily replaced by Antti Niemi and a younger, cheaper netminder. The killer when the Hawks try to trade Huet, though, is the number of decent-to-good goaltenders that will be free agents this coming summer. Why would a team trade for Huet and pay him his cap number when they could sign someone like Martin Biron, Jonas Hiller, Dan Ellis, Ray Ellis, or make a qualifying offer for a player like Jaroslav Halak or Kari Lehtonen. 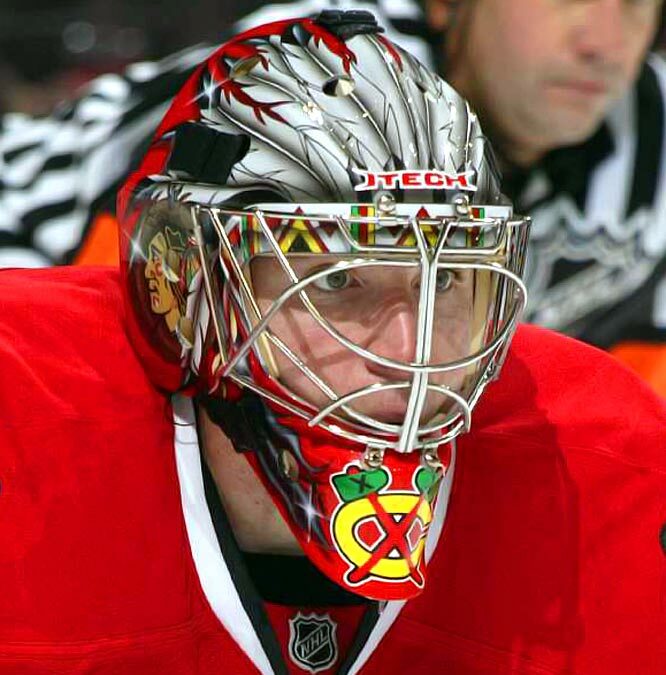 We haven’t even mentioned older goaltenders like Marty Turco, Jose Theodore or Evgeni Nabokov yet, either. In all, there are 24 goaltenders that will be free agents this summer, only one of whom, Turco, has a higher cap number than Huet this year. So trading Huet might not be an option. However, signing one of the 24 free agents might be, and the net cost of keeping Niemi and adding a free agent could be lower than just Huet by himself next year. Thus, the buyout conversation begins. If the Hawks decided to buy out Huet, they would be able to stretch out a percentage of what they owe him over a longer term. Without getting into the boring math of the discussion, the difference between Huet being on the payroll under his current contract and the financial implications of buying him out could mean the difference between keeping a player making $3 million and losing someone like Versteeg, Byfuglien or even Sharp. Huet stands to make $5.625M for two more seasons. If the Hawks opted to buy him out, they would pay him $1.875M for four more years. Yes, the Blackhawks would have him on the payroll in 2012-13 and 13-14 under this scenario, but the organization would save $3.750M in each of the next two seasons by buying him out. Assuming the Hawks re-sign Niemi at a larger salary, and either (finally) promote Corey Crawford or sign a free agent, the total net cost for the Blackhawks to have two netminders could be under $2 million. If the Blackhawks bought out Huet, they would need to only move roughly $6-7 million more off their payroll for next year. Trading a player like Sopel, who will make $2.333M, would make that number closer to $5M, which means moving only two more players would make the math work. Further considering the Hawks organizational depth, it’s realistic that Barker and Sopel could be replaced by Jordan Hendry and a prospect like Shawn LaLonde for significantly cheaper than the cost of the two veterans. There will be trades, and next year’s Blackhawks might not look a lot like this year’s version. Bowman has the job of keeping the Hawks competitive in the future, and the first step in doing that might be buying out Huet. First, I commend you for doing the math and being realistic about the difficulty in dealing Huet and his contract. And I think you’re right that the net cut in salary needs to be around $10 million. Although my math says more like $12 million. “Net,” meaning a figure arrived at through gross salaries cut, minus the salaries of players either signed or promoted from Rockford to replace those lost players. Two places where I think your argument takes on some water. First, even spreading the damage of the buyout over four years, nearly $2 million a season in dead cap space is just not something this team can remotely afford. Compounding that, with Niemi as #1 (which I believe he will be, regardless, after this season), you need to have a “1B” backup goalie on a team with a legitimate shot at a Cup, especially with Niemi still being relatively inexperienced at that point. Corey Crawford is not that. At least, he won’t be that next year. Maybe a Biron is, for example. So you have to pay that goalie something, too. It’s a possibility. But I think the greater likelihood is Huet stays until the last year of his deal, THEN, he might get bought out or dealt to a team that needs a veteran for part of a season. This is a great article, I located your website researching google for a related topic and came to this. I couldnt get to much alternative material on this piece of content, so it was pleasant to discover this one. I likely will be returning to look at some other articles that you have another time.